Is there a better alternative to Wax? Is Wax really the best app in Music category? Will Wax work good on macOS 10.13.4? Wax makes it easy to make a list of your music disc collection. You can create collections of discs you own, discs you want, and even discs you want to recommend to your friends. Collections are sorted by the musician's name then release year. Easy-to-use index buttons let you see the artist's discs with initials on each button. Indexes can be set in preferences. Each index must be one letter (except VA for "Various Artists"). 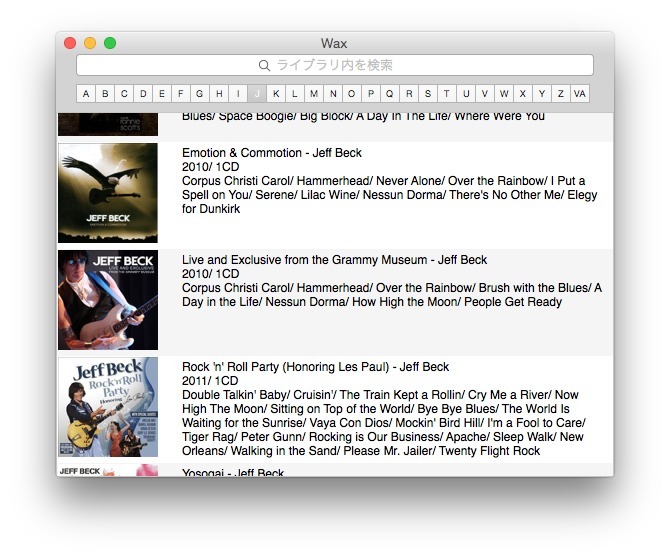 The search field will search your collection by keywords. To scroll, simply put your cursor on the cover images. Wax needs a review. Be the first to review this app and get the discussion started! Wax needs a rating. Be the first to rate this app and get the discussion started! To add a new item, select Edit > Add Disc Info. Fill the inputs with Disc title, Musician, Released year, Disc Count and Track Listing manually. To add the cover image, drop onto the square space left. Or fill the disc title and hit return to get this done automatically. The app searches allmusic.com and get the info for you, only if they can be found. To edit existing items, select a row and command+E. Edit and press OK to save. To remove one, hit delete key. Exporting to HTML is supported. This will write one html doc and one images folder.